Perennial. Zone 3. Solanaceae. Eastern Europe into Asia: southeast Russia, Armenia, Crimea and Dagestan, Anatolia, and Tajikistan, Uzbekistan, and Kazakhstan. Syn. Hyoscyamus orientalis, Scopolia orientalis. Slightly ironically, this is the westernmost species in its genus, despite the “orientalis” common to its synonyms. The genus name, Physochlaina, comes from the Greek: physo meaning a bladder or air bubble, and chlaina, an outer garment, specifically a short coat. This descriptive epithet is in reference to the inflated calyx at the base of the flower structure, which swells after the blossoms drop and the flattened ivory seeds develop. Orientalis meaning “of the orient”, “of the East”. 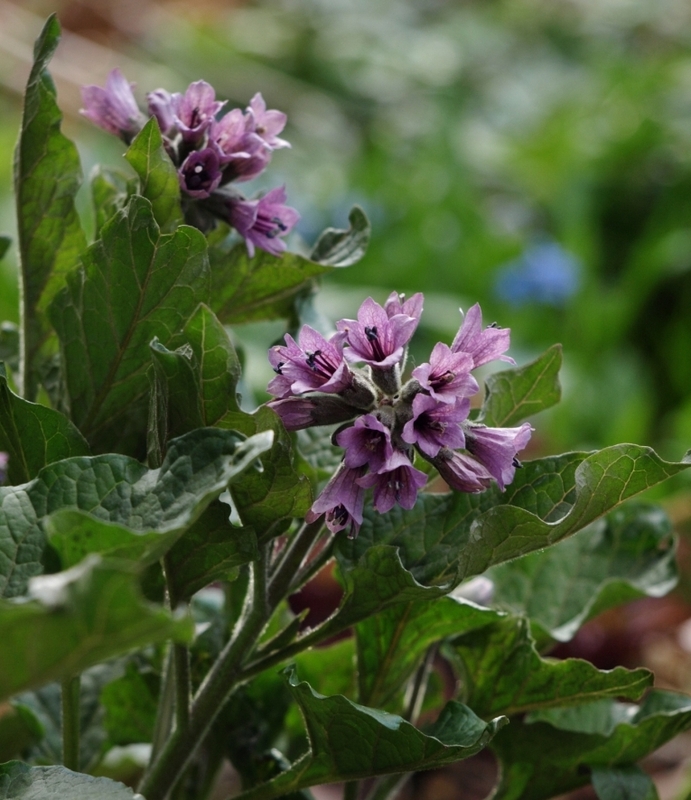 In its native regions Physochlaina orientalis is a plant of rocky mountain slopes and open deciduous forests, being found at elevations up to 2000 metres. 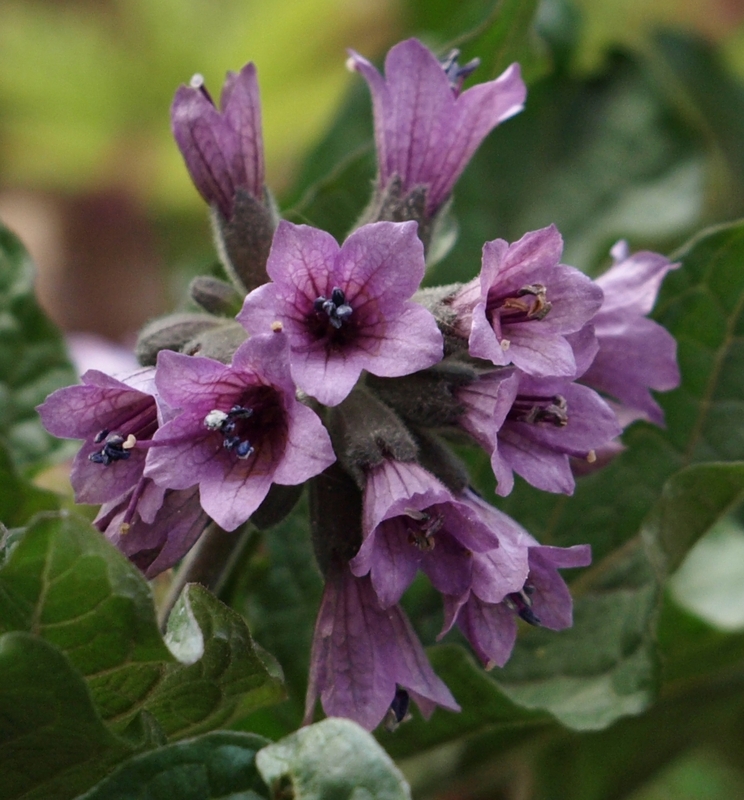 Here at Macalister, this small, rare Nightshade Family member is quietly noteworthy for the month or so of its early spring emergence and flowering. First shoots are dark purple – almost black – with the leaves turning green as they unfold. 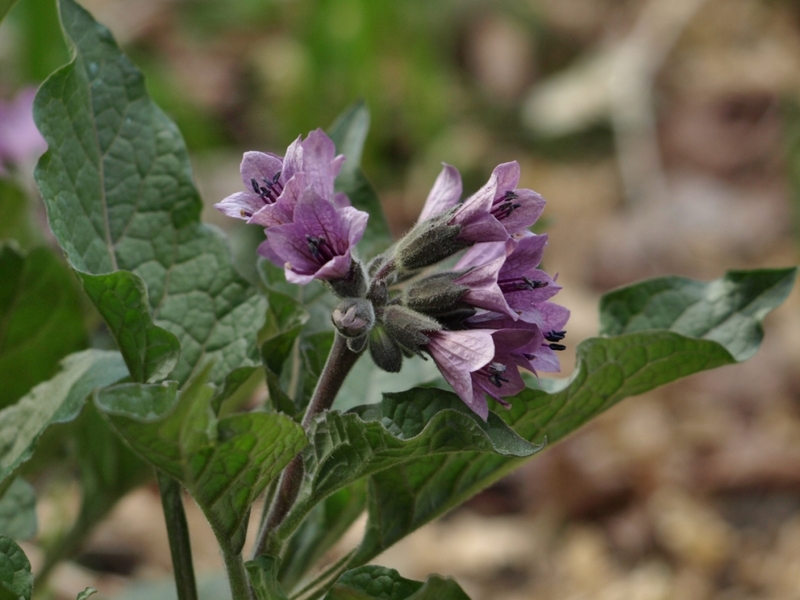 Bloom stalks appear in late April, crowded with clustered buds which open into nodding, smoky-purple, dark-veined bells. Flowers are produced over a period of several weeks, as the stems elongate to an eventual height of 12 inches or so. Foliage is oblong, softly hairy, wavy-edged and dark-veined. Leaves clasp the bloom stalks and spread outwards as the season progresses, giving an effect similar to a smallish, unspotted Pulmonaria, though the two are not related. The aging blooms drop off as spring advances, leaving behind inflated calyxes in which the seeds develop. Once seed matures sometime in early summer, the leaves begin to yellow and the plant goes into a dormant stage, completely disappearing until the next spring when it returns with a few more bloom stems than its previous year. Physochlaina orientalis forms semi-tuberous, rhizomatous roots, with multiple shoots emerging from a central base, and its colonies slowly expand over time. It self seeds modestly once well established, but is in general a very restrained, well-behaved plant, staying exactly where it is placed, and growing in beauty year after year. Spring-foraging bees are attracted to the small trumpets of the blooms, which are at their peak during appleblossom time, along with Fritillaria meleagris, the earliest species Columbines (Aquilegia flabellata, A. viridiflora), and the early spring Violas and Primulas. This easy, hardy, summer ephemeral is quite adaptable as to siting. It thrives in sun to part shade, and though it enjoys a humusy woodland soil and early season moisture, it is very summer drought tolerant as it goes into dormancy with the onset of the hottest days. Good in the woodland border, mixed perennial border, or rock garden. The species of Physochlaina are extremely desirable plants; being early flowerers, and elegant when in blossom. They will grow in any soil, and are readily propagated by divisions of the root, or by seed. They are well adapted for decorating borders in early spring.